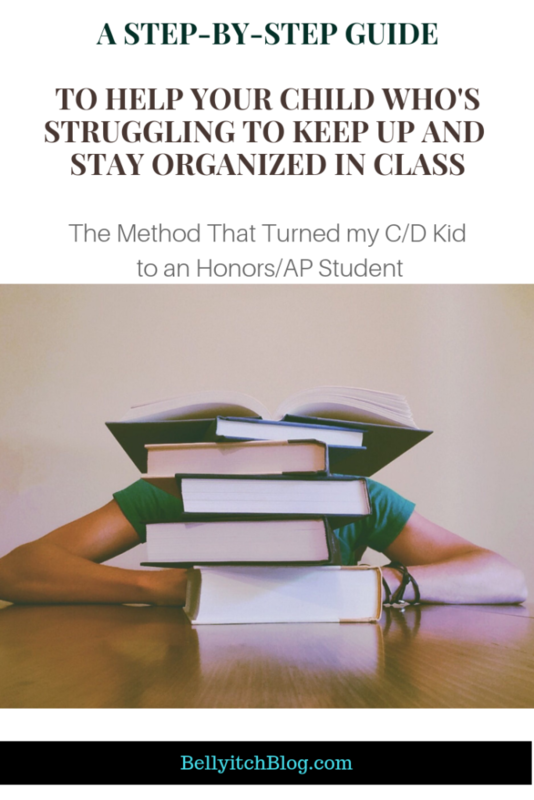 For Your Child Starting Off the School Year Struggling to Keep Up, Implement This Method That Worked For My Kid! Now that we are well into the new school season, some parents may notice that their child may be having a tough time adjusting and may have started the school year on the wrong foot. He or she might have failed a few quizzes, missed a few homework assignments or lost points on careless or silly errors like failing to give you a syllabus to sign and return. The transition from elementary school to middle and high school for many children can be challenging, especially for boys. Also, a lot of children, especially young men, suffer from Executive Functioning Disorder which is exhibited in kids who have tough times keeping their papers organized, lose homework, cannot keep up in class or with notes and just struggle with the organization aspect of being a student. These children are not necessarily developmentally delayed and many can actually handle the coursework if only they could get their act together. When my now 16-year old was 12-years old, he had a had a difficult time managing his time, classes, deadlines and as a result, his grades suffered for almost two years. It took me awhile but I finally figured out part of the root causes of his struggles: he didn’t have organizational study skills, and later he was actually diagnosed with Executive Functioning Disorder. He isn’t alone, I am sure, especially for kids entering middle school or high school or who are going from the easier and less challenging school or program; or years in school, to the more advanced schooling, or coursework that requires more independent thinking. Children go from having one teacher who guides them for all of their subjects to having to deal with multiple teachers and classes, numerous binders, folders, notebooks, papers and assignment books. From one year to the next, they have syllabuses from different classes all with various project, quiz, exams and other deadlines. Class lectures also are different. They require focus to retain the information being taught where before the class is broken up by activities, gym class, outdoor play and lunch. It made learning less stressful. In middle school, teachers expect more active class participation. It’s not enough to coast quietly. Same can be said of high school, or some private, elite or competitive schools. Many school children in this stage need a method to help them keep track of their work and to prioritize their assignments and due dates. To help my son, I searched the internet for resources, tips and advice and came up with a system and came up with a plan that worked! I am sharing it here for any other parent who may be dealing with a transitioning child who is also having a tough time meeting their school obligations! Throw out the multiple notebook method that the school requires and going to go with a one binder method. 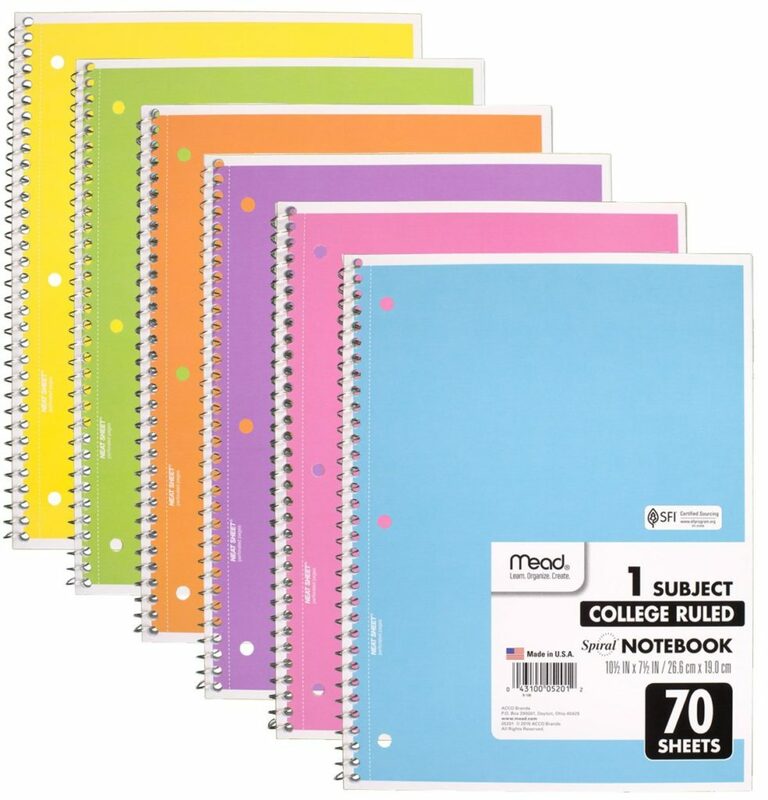 Purchase one mega 3 inch three ring binder and purchase 5 thin one-subject spiral notebooks to go in it. 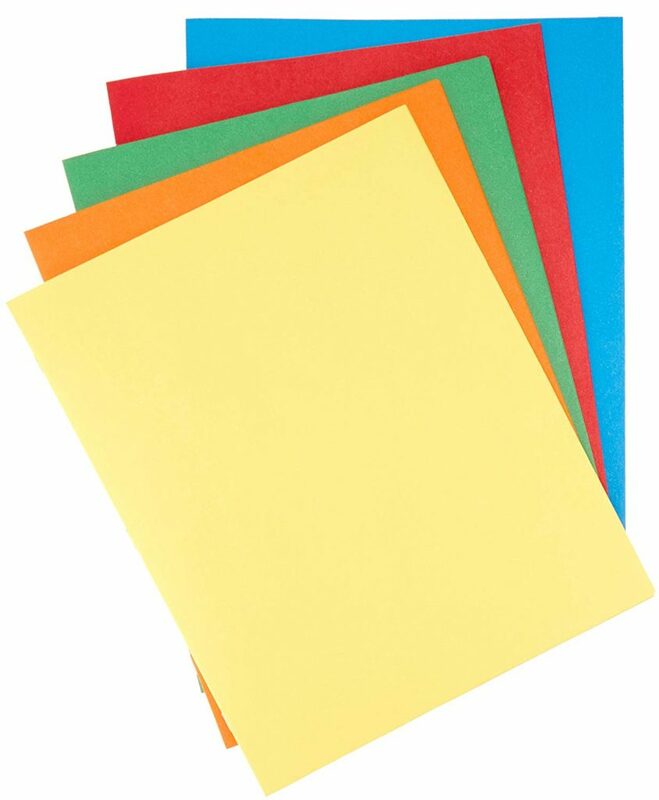 Purchase matching color-coordinator two-pocked three-hole punched folders to accompany each subject that will be placed behind each notebook. In the left pocket of each folder, he will insert his class syllabus for the year or semester or term. The right pocket will be used to hold loose-leaf assignment sheets and info sheets distributed during class. The notebook should used for note taking on one side of the pages only and dated at the upper right hand corner so he can keep track. The front first page will be a wipe-able laminated monthly calendar that can be reused each month where your kid will input all quizzes, exams and project deadlines for all classes in one space. The weekly homework sheets should be hole punched and placed behind the monthly calendar. On that weekly homework sheet, have her jot down homework and other deadlines for each day of the week. This one binder system should minimize the problem of when your child leaves his book or notes at school thus meaning he will not have them to use to study over the weekend. Also, this one binder system eliminates the problem of a child with executive functioning disorder who has a difficult time keeping track of handouts and due dates. All of the papers will all be stored in one location for easy reference. Also, with this one-binder system, your son or daughter will bring home all the work so you will be able to follow up and double check he or she is staying on track. A Large Central Family Calendar to hang in the kitchen or family room where everyone can see it. On this large calendar, put important dates including vacations, birthday parties, doctor’s appointments on it but also test, project due dates and quiz dates. If you have more than one child, like we do, dedicate a different colored marker color for each child and family member so they can easily see what applies to them with a glance. This large calendar may help your child or children organize in their mind(s) as well as let you know who has what exam coming up or assignment due and when too. Update it weekly with field trips, school activities, out-of-school sports and activities, dance and music rehearsals etc. A Storage Bin: Get a bin with multiple compartments that can store paper, notebooks, blank flash cards, pencils, pens, markers, crayons, staples, glue, scissors, compasses, protractors, rulers and all the materials that may be needed for homework or a short project. It takes away the time wasted looking for a sharp pencil that children use as an excuse to procrastinate from starting. Have this storage bin be located in the designated study area or nook in your home. 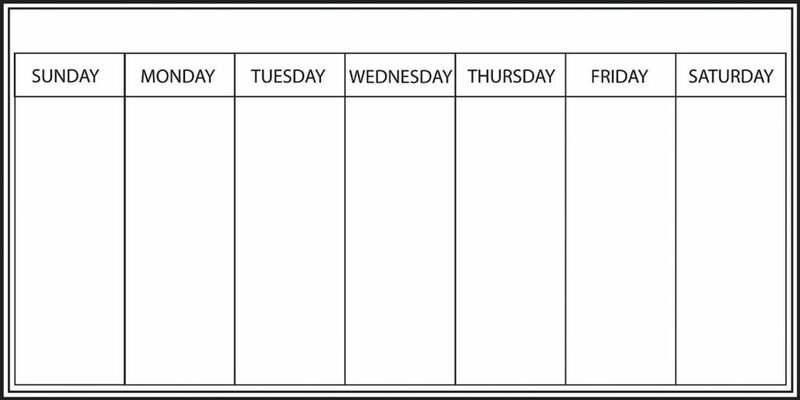 A Weekly Calendar: Like the monthly calendar, the weekly calendar should be updated each Sunday before the new week with tests, quizzed and other due dates. . Have your kid or kids review your class notes from the previous week to see if you need to add any school activities. Timer: Use a timer on your smart phone and set it for 15-20 minutes of uninterrupted study, then allow for 5-10 minutes of break to help a child who has a tough time concentrating and working non-stop. You can also purchase a timer just for this purpose. It’s also great for kids who have or are borderline ADD/ADHD and/or have executive functioning disorder. Daily To-Do List: Some children need daily reminders of what to do each day and even though you tell them, they forget. Having a fixed daily schedule up on or near the fridge in the kitchen or other heavily traveled area is a good idea. Ours include minutiae: Bathe, brush teeth, put on deodorant, dress, brush hair, eat breakfast; and after school and after library: undress, hang up uniforms, dinner, get forms signed, pack backpacks and knapsacks for the next day and leave by door, unpack lunchboxes and dump uneaten stuff and trash, warm milk, reading or practice instrument, quick study, bedtime. For those who drive their kids to school daily, you can start out with the morning news or music program on as the kids fuss and fight in the back, but getting closer to school, cut it all out and give your kids a pep talk and say a prayer, meditate or a few affirmative words so they are prepared for the day. (depending on your beliefs). A pep talk I gave recently did the trick to empower my son to be more independent and seek assistance from his teacher on a certain missed task on his own. Score one for mom! For non-drivers, try to carve out a few moments before the school bus arrives or heading out on your public transportation commute to do the same. Talk to your child about the importance of being cognitively ready to listen during class. If they have all their assigned work and readings completed before each class, they will be better equipped to participate and pay attention. I instructed my son to spend the first few moments before class begins to review his notes from the previous day for a refresher and to prepare for what’s next. Having that information fresh in his head hopefully will encourage him to raise his hand when questions are asked and to participate during oral call and response time. Take Notes. It is important to take good notes in class. Taking written notes almost forces a child to concentrate on what the teacher is saying. Notes, of course, also help them prepare for tests and provide clues as to what their teacher thinks is most important for your child to know. Further, notes will contain information that may not be in the textbooks. Write the date at the top of each page of your notes and number the pages. This will help you to keep your notes in the proper sequence. Keep your notes for each class separate from your notes for other classes. You can use different color tabs to help you do this. Be selective in what you write. On average, the speaking speed of teachers is five to six times faster than is the writing speed of students. Quite simply, do not try to write everything your teacher says. Use abbreviations and symbols to increase your notetaking speed. Don’t be too concerned with spelling and grammar. These notes are for your use and will not be graded. Ask your teacher to repeat something you think you may have missed. As you write points made by your teacher, translate these points into your own words. Doing this will increase your understanding of your notes and your ability to remember the information they contain. If your teacher provides a definition for a word, write that definition in your notes word for word!!!! Write legibly. You will have to read your notes later on. Include in your notes information your teacher writes on the board. Stay especially alert during the last few minutes of the class. Teachers sometime use the last few minutes of a class session to cram in everything they wanted to cover but didn’t. The most important part of getting good grades is completing homework assignments and studying for quizzes and tests. Establish a Good Study Environment: First, establish a good place for homework and studying: Find a place in the home, a desk in your kid’s room or your room even, in the kitchen or basement that is free from interruptions and distractions. Get a desk or table big enough for your child to spread out their books, notebooks, pens, crayons and other materials. Have a storage unit for keeping crayons, extra pens, pencils and paper. A good chunk of study time is lost in my home by kids going on searches for a sharpened pencil. It’s part of the distraction that keeps them away from their homework. I am going to update my home office so that each child has his own table and space. It will be a distraction free venue and space for them. Make sure their chair is comfortable, there is plenty light and the room is not too warm so your child doesn’t get sleepy and not too cold that they are distracted by shivering. Go to the library if you don’t have such a place. Make a routine out of it. My kids and I go after school each day. If your child is in an after-school program, usually, they have time for uninterrupted homework doing. That works too. Make sure there is no TV or music or video games being played by other children during study time at home. If possible, and I encourage this, have a no TV or video games policy during the school week to discourage distraction or them rushing to complete homework just so they can play before bedtime. The quality of their work will show. Encourage Frequent Breaks – A lot of children find it difficult to focus or study for extended periods of time without doodling, goofing off, picking up a comic book or doing something else instead of their homework. No problem. Breaks are great to reduce stress, allow time for the brain to process learning, and good for transition. Work them into the schedule. Set a timer for 15 -20 minutes of uninterrupted work, then 5 minutes of break time. During the break, the student can get up, stretch, grab an apple or snack, flip through a fun book, go for a walk around the library, check out their social media accounts, then when the timer is up, get back to work for another 15-20 minutes. The best way to be certain that your class notes are complete and accurate is to review them in the evening while the information that was covered in class is still fresh in the mind. 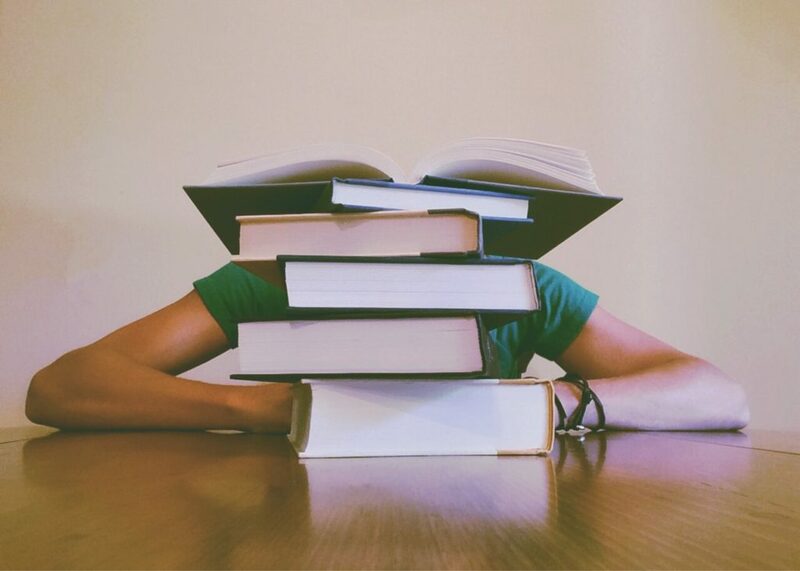 During down times, after homework is complete, middle school and high school kids should rewrite their notes, correcting any errors, filling in any gaps, and adding additional information as appropriate. Rewriting class notes also provide an opportunity to improve their organization and to make them neater, thereby making their notes easier to study from. Further, rewriting class notes reinforces the information so that they will remember it better. Use Flash Card: Flash cards are a powerful tool that can help your child remember information such as the meanings of vocabulary words, mathematical formulas, history facts, and the correct spelling of words. Tips for Remembering can also come from mnemonics, Acronymic sentences, Loci strategies, and Pegwords. Make an outline from notes of just the main ideas. Make a timeline of important dates or the order of event. Read the instructions carefully. Never assume you will know what they will say! Ask the teacher if you are unsure about anything. Read the entire test through before starting. Notice the point value of each section. This will help you to pace yourself. Answer the easiest questions first, then the ones with the highest point value. You don’t want to spend 20 minutes trying to figure out a two-point problem! Keep busy! If you get stuck on a question, come back to it later. The answer might come to you while you are working on another part of the test. If you aren’t sure how to answer a question fully, try to answer at least part of it. You might get partial credit. Need to guess on a multiple-choice test? First, eliminate the answers that you know are wrong. Then take a guess. Because your first guess is most likely to be correct, you shouldn’t go back and change an answer later unless you are certain you were wrong. On an essay test, take a moment to plan your writing. First, jot down the important points you want to make. Then number these points in the order you will cover them. Keep it neat! If your teacher can’t read your writing, you might lose points. Don’t waste time doing things for which you will not receive credit, such as rewriting test questions, though I suggest including some elements of the question in your answer for organization and to show the teacher you are responding to the actual question. Also, doing this will guide your answer. Be thorough and add the word “because” or “therefore” after each answer to force you to elaborate and expand so your answer is comprehensive. Leave time at the end to look over your work. Did you answer every question? Did you proofread for errors? It is easy to make careless mistakes while taking a test. Encourage Task Lists – I am a compulsive list-maker and they keep me sane and my brain organized. Consider getting into the habit yourself or encouraging your kids to as well. After creating this blog post, I sat down with my son and went over it and had him help me prepare the organization sections and review the links herein. I hope it is helpful for you too! Good luck! And come back here and comment to let me know if you used this how it worked out for you!